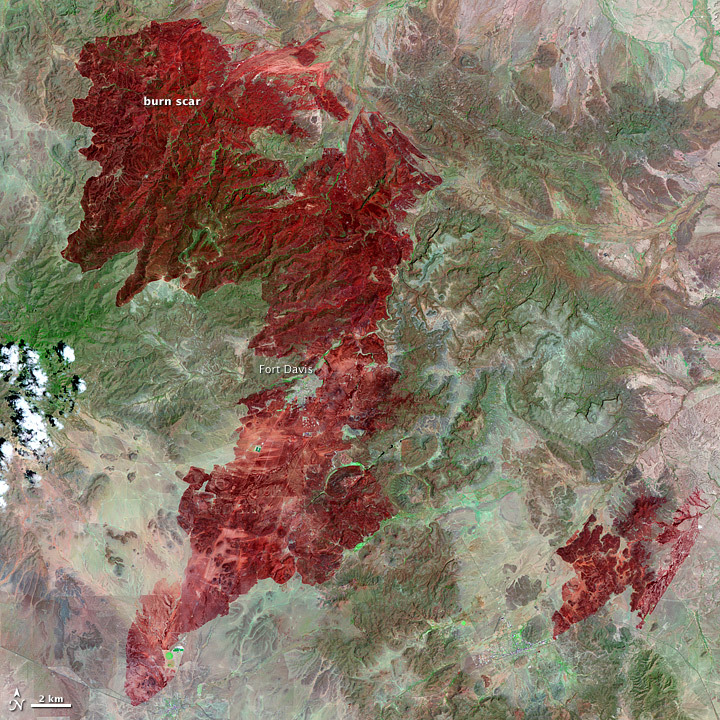 This Landsat image, taken on May 2, 2011, shows the 314,444 acres burned in the Rockhouse Fire in southwestern Texas. The fire was initially reported on April 9 and was 95 percent contained by May 6, said the Texas Forest Service. Charred land is dark red in the false-color image, while unburned land is green (where covered with plants) and tan. The fire threatened the community of Fort Davis, shown in the center of the image. The Rockhouse Fire was one of hundreds that burned in Texas in April 2011. Drought, high temperatures, and strong winds combined to create highly dangerous fire conditions. Since fire season started on November 10, 2010, 9,496 have burned 2,293,095 acres of land in Texas, said the Texas Forest Service on May 6. NASA Earth Observatory image created by Jesse Allen and Robert Simmon, using Landsat data provided by the United States Geological Survey. Caption by Holli Riebeek. This Landsat image, taken on May 2, 2011, shows all 314,444 acres burned in the Rockhouse Fire in southwestern Texas. Low humidity, dry vegetation, and high winds fueled several large wildfires throughout Texas in April 2011. Texas Forest Service. (2011, May 6). Current Texas wildfire situation. Accessed May 6, 2011.